American politics and media often play up the supposed “core” or “true” America. In politics, Iowa and New Hampshire are the first states in the country to vote in primaries (or caucuses in Iowa’s case), with heavy weight given to such. In media, despite Hollywood/New York often prone to ignoring or belittling “flyover country,” a suburban or small Midwestern town will often be shown as a representation of “true” Americans and American values. A strong example of this is Superman’s backstory. As a baby, Kal-El landed in the rural town of Smallville, where he was found and adopted by kindly farmers Martha and Jonathan (or “Ma and Pa”) Kent. The Kents raised young Clark with strong, wholesome morals, and helped make him the (super)man he is today. I like old Superboy stories and, like Clark Kent, also grew up in a small Midwestern town. But while the Kents are representative of the best aspects of America (and humanity), their backgrounds and hometown of Smallville aren’t particularly representative of modern-day America. All of the cities are in the Midwest or eastern half of the US. Relevant to Smallville, Wichita (in Kansas) and Kansas City (in nearby Missouri) both are deemed representative. Kolko’s article notes that the cities representative of 1950s-era America are more rural or smaller in size. The cities that come closest to 50s-era US demographics include: Ogden, UT; Lancaster, PA; and Chattanooga, TN. The 1950s are often a decade some (mostly conservatives) hold up with nostalgic fondness or as a model. 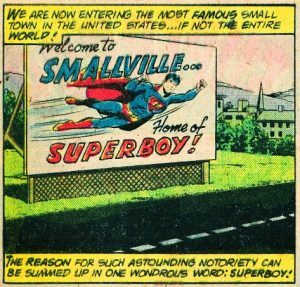 It’s also when the Kents’ backgrounds and settings as characters became firmly established (beyond Superman’s origin story); Smallville was first named as the Kents’ hometown in “Superboy” #2 in 1949. Of course, the Five Thirty Eight article mainly looked at metropolitan areas, versus small towns. But going by the US Census, most Americans live in urban or suburban areas nowadays, not rural towns. In 1950, 64% of Americans lived in urban or suburban areas (versus rural), versus 80.7% in 2010. The tipping urban/rural point in favor of urban came with the 1920 census. Narrowing it down to Kansas, Smallville’s usual state since the 1986 comic reboot, in 1950 52.1% of Kansans lived in urban areas, versus 74.2% in 2010. See my earlier post on how big Smallville is, but it’s a small-sized city at best. As for racial/ethnic makeup between 1950 and 2010, in 1950, non-Hispanic Whites made up 87.5% of the US population. By 2010, they made up 63.7%. “Superman Family Adventures” #11 (May 2013). Art by Art Baltazar. 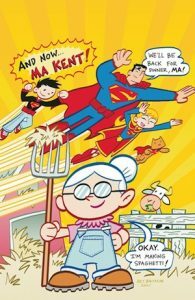 The Kents are portrayed as farmers in Golden Age stories, as well as most modern stories. In the Silver Age (per the Superboy series), the Kents were farmers, but sold their farm and opened a general store in Smallville by the time Clark started school. I assume the 1986 Superman reboot reverted the Kents back to being farmers to seem more “all-American,” “go back to their roots,” or remove them from any association with the Silver Age. However, the figures below suggest the Kents owning a store would be much more likely in modern times. In 1950, farmers made up 12.2% of the labor force; by 1990, the percentage had dropped to 2.6%. If wondering, the tipping point where most Americans weren’t farmers came by 1880. On top of that, 2012 USDA figures show the majority of farmers now have sources of income or work away from their farms. 52% of farmers have a primary occupation other than farming, while 61% work some days away from their farm. Ultimately, the Kents might want to reconsider the idea of running a store in downtown Smallville, at least part-time. The Kents’ blue-collar backgrounds are relatable, more so than plenty of other characters in comics (which are full of 1%-er billionaires, royalty, etc.). However, their current occupations and place of residence are representative of few Americans. 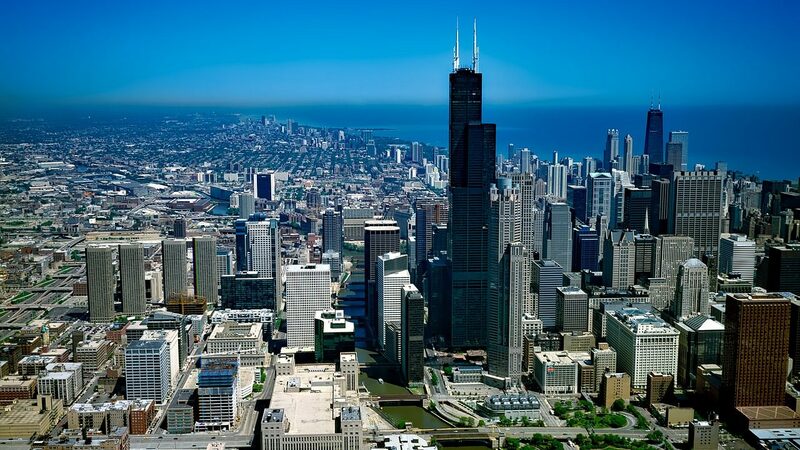 Overall, despite bluster and bashing by some politicians of those living in larger cities as “elitists,” metropolitan areas and their suburbs are more reflective of modern demographics. It’s simply where most Americans now live, period. Of course, even Clark Kent moved away from Smallville to Metropolis after finishing high school.